This kitchen process is taking a lot longer than expected and we haven’t even started demolition yet! Luckily, I go to my mom’s once a week to get her Chinese recipes, but when I’m home, I’m still using only plug-in appliances (rice cooker, toaster oven, panini press, waffle maker, microwave, etc.) I didn’t foresee having to keep this up for so long but the challenge has been fun. Aren’t you amazed by how much I (or you) can do without a kitchen? While we were in Kennebunkport, I fell in love with a Lemonade stand. While long lines formed at peak times, they never made the lemonade in batches. We stood on the slow-moving line and watched as the summer teens squeezed lemons (they did have a juicer) and made each cup to order. I happily sipped all the way back to our hotel, feeling rejuvenated and refreshed. The citrus accents swirled together with the sea breeze, a real treat for a city girl. At first, Lon and I talked about what a good formula they had. They got the balance of tartness and sweetness to a perfect T. Yet, with more thought, I realized that this was only half of the secret. I’m willing to bet that the reason this lemonade really beats the rest, is because they make each cup to order. Cut open a fresh lemon and smell it as soon as the oils of the zest release into the air. Sometimes you can even see the magical mist. Now leave that lemon on the counter for a few hours and smell it again. It will have lost some of that sparkle of life. Making each cup of lemonade to order ensures capturing the vitality and essence of the lemon that diminishes over time after it’s cut. From now on, I won’t make lemonade in a large pitcher and leave it in the fridge for days. I’ll make it fresh each time I want to drink it. It’s really not that much work and I bet you already have all of the ingredients. I did provide a formula for what I consider balanced, but feel free to tweak it to your preference. The real secret is making lemonade by the glass. 1. Pour water into a large drinking glass. Stir in sugar and dissolve. 2. Quarter and juice the lemons and measure out 3 tablespoons of lemon juice. Stir the lemon juice and ice into the glass. Add a juiced lemon quarter to the glass. Drink immediately. posted by jessica	at 08:09 AM	Filed under American, Drinks, Recipes. You can follow any responses to this entry through the RSS 2.0 feed. Both comments and pings are currently closed. 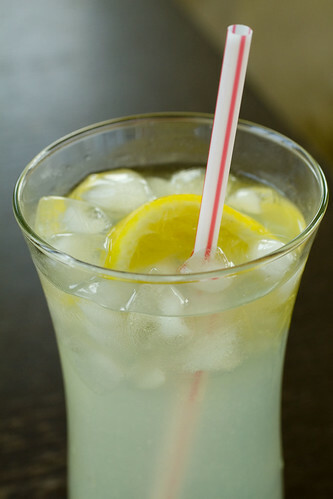 Nothing is more refreshing in hot weather than a cold glass of tart lemonade, Jessica! And you are having some big time heat up there right now! 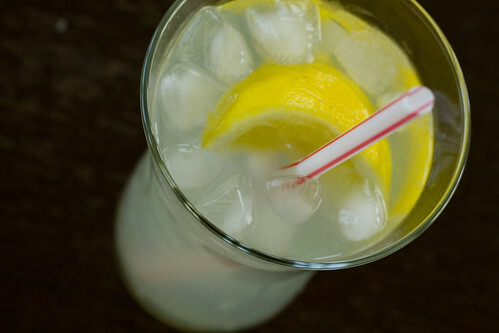 You have the right idea…FRESH lemonade made to order! It’s also less daunting than making a pitcher and squeezing a dozen lemons. There is nothing more refreshing than lemonade. This is great, and inspiring- I might have to make some fresh to order today during this heat wave in Vancouver. I recently read that putting chia seeds (yes, the kind you make chia pets from LOL) in limeade really adds something special. I haven’t tried it yet, but I did order some seeds. I plan to try them with lemonade, too. I’m so thirsty now! You know, I’ve also been loving watermelon rind in a pitcher or a little watermelon with my water. Have you tried that? Barbara, it’s crazy. My dog doesn’t even want to go out. Cheryl, I’m not going to wish our weather on you. It’s been total ick. Hope you get some sunshine though! Haven’t heard about the chia seeds. Let me know! Liza, I have had it and it’s wonderfully refreshing without having to add the extra sugar! This brought back fond memories of my father teaching me how to make lemon tea (not lemonade though). He follows a certain procedure, which brings out the sweetness of the drink. Too bad our relationship isn’t as sweet as the drink anymore. Lemonade by the glass is always perfect! That’s exactly the way all the vendors make it at the MN State Fair. It probably seems all the more delicious because it’s always so freaking hot and crowded at My Favorite Summer Event in MN. Perhaps it’s like having a citron presse in France – also always delicious and always made by the glass – location is everything. You know, it’s funny but I never really thought about making this by the glass, but it makes sense given the tough skin lemons form when left out, and I’ll now imagine my lemonade losing vitality when I make it by the pitcher! Sometimes I cheat and drink Newman’s Own since it’s the only commercial lemonade that tastes close to the real thing to me. The most depressing thing I ever encountered was a bunch of kids selling lemonade at a stand….and it was Crystal Light lemonade. And they were charging $1.50/glass. I’m sure they will one day do well in business. EMC, I gotta blame the parents. Lazy! Oh! Is that a Jack Russell Terrier in the background? I miss my Jack. 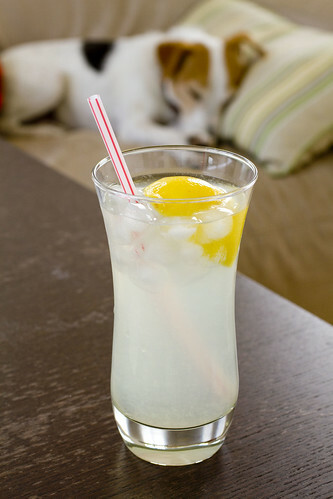 The Lemonade looks like just the thing for a warm July day. Mary, that is my JRT sleeping in the background. Her name is Ice and she brings joy and cuteness to every day of my life. This made me wanna throw up. It really dosen’t work!